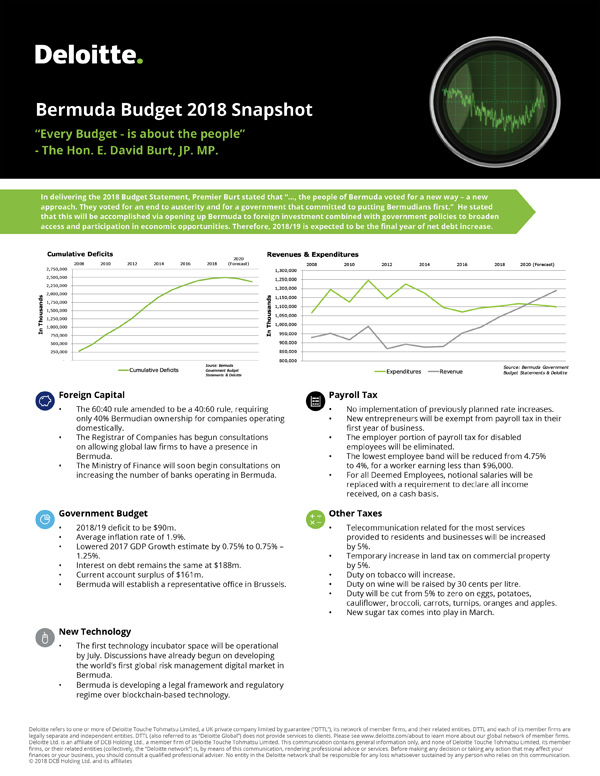 Following the delivery of the 2018 Budget by Premier and Minister of Finance David Burt this morning [Feb 16] in the House of Assembly, Deloitte released a ‘Budget Snapshot’, which highlights some of the key points from the Budget Speech, and follows in full below. You can click here to view our live blog, and click here to view all our coverage of the 2018 Budget. At first glance, the revenue projections look very optimistic. Given that 2017 included the significant positive impact of the Americas Cup, can we really expect to keep increasing revenue year on year as projected? Burt Math will be back next year when the actual vs budget comparison is done. Someone do let me know….I do not recall of Deloitte pushing forth their ideas, etc. When Bobby Boy pushed through like a bulldozer only months ago, there were no responses as such. This brings up the imbalance in styles and methodologies of the 2 very differen political parties. Persevere on in brilliance and the knowledge that the roots people of Bermuda support your energetic and committed way in delivering what the people need, so desperately!! Deloitte has been publishing a Budget Snapshot every year for ages. They’re not pushing ideas, just summarizing what the Finance Minister says into a single page of bullet points and graphs. This is fantastic ! Yesterday I added your ‘certain cluster’ phrase to you list of code words and today we have still another . They have done this exact same report for at least 10 years.